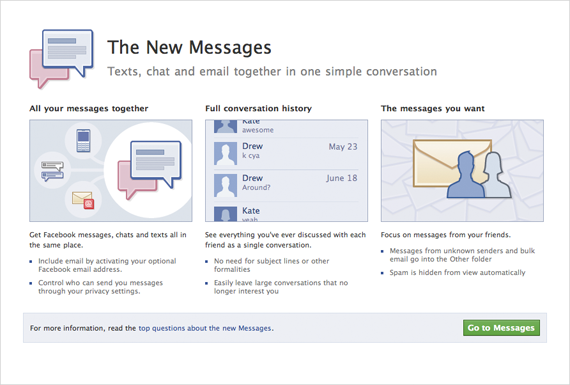 Facebook has finally announced their E-mail service features for their facebook users. 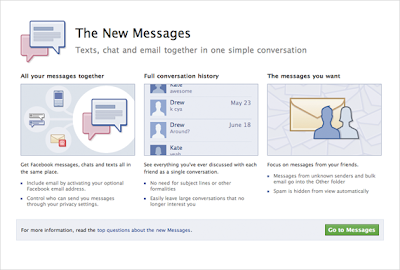 Now you can get all your Facebook Messages, Chats, and Texts all in same place with this new E-mail service same as you use your G-mail, MSN and Yahoo E-mail account for sending and reciecing E-mails. You will get another domain of @facebook.com by creating your Facebook E-mail Account. So if you want to get your Facebook E-mail account you just have to visit this URL: http://www.facebook.com/about/messages and click on the “Go To Messages” button Or "Request Invitation" button as pictured in the image below. That’s all you need to do!